One of my first golf inventions was a device that — selfishly — measured the precise location of the sweet spot on my putter’s face. It worked like a charm. As you can imagine, all of my friends soon wanted me to sweet-spot-mark their flatsticks, too. Who could blame them? Contacting the ball on the sweet spot delivers a better roll and dramatically increases the chance of holing a putt. Inspired by my friends’ collective interest, I launched headfirst into marking the sweet spot of every putter I could get my hands on. The sweet spot (technically known as the center of percussion) defines the area on the putterface that, when contact is made with the ball during a putt, doesn’t make the putterhead twist — instead, it allows it to keep moving straight forward. It’s the singular point where maximum energy can be transferred from putter to ball. Any mis-hit away from the center of percussion (either toward the heel or the toe) will cause the putter to wobble. That’s bad for accuracy, to say nothing about the loss of energy, putt speed and, as a result, distance control. Locating the sweet spot was one thing. Finding a way to train my stroke — and those of my friends — so that I could exploit it on every putt became the obvious next step. Enter my next invention: a putter that could actually groove a stroke to consistently produce contact in the center of percussion. I called it the “Teacher Putter.” It featured a set of prongs that projected forward off the face, bracketing the sweet spot. Miss the sweet spot and either of the prongs would deflect the ball wildly off line. If desired, the player could reverse the prongs and imbed them in the sole of the club to give the putter a standard, flat face without disrupting the overall head weight. It took a few iterations to obtain USGA approval, but we got it right. Two-time U.S. Open champ (now ESPN commentator) Andy North used the Teacher Putter in practice to develop the most consistent sweet-spot stroke I’ve ever seen. It worked so well that he trotted it out on Tour, and even bagged one of his U.S. Open wins using a Teacher Putter. I’ve learned a few things about the game over the years that are truly meaningful, and striking putts on the sweet spot is one of them. 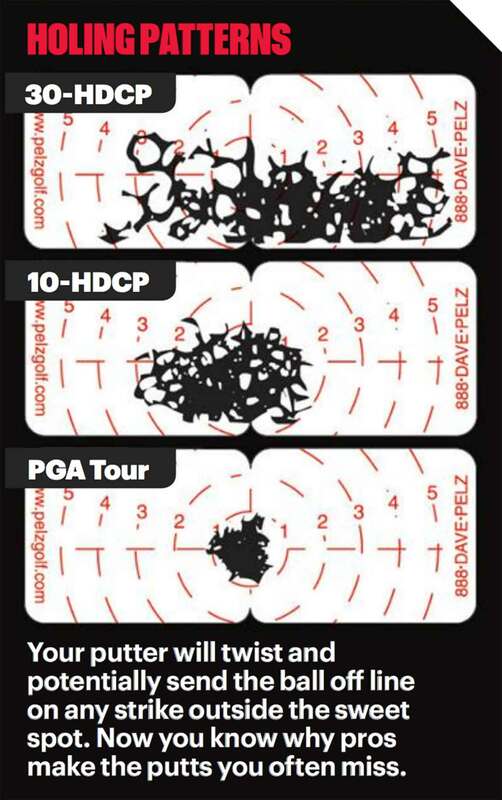 For proof, look at the putting impact patterns above, taken from a typical 30-handicapper (top), a 10-handicapper (middle) and a PGA Tour player (bottom). The difference in impact consistency is staggering. I don’t make putters anymore, but I still promote the use of learning aids to help you learn how to catch the sweet spot on every putt. There are plenty of effective options out there, including a few of my own design at pelzgolf.com. With feedback, you’ll groove a sweetspot stroke faster than you can imagine. It may never be as consistent as Andy North’s, but it’ll certainly be more consistent than the one you have now, and you’ll see that in a ton more makes, both from distance and short range. Now that’s sweet.